Covered parking and private yards, the house has full amenities necessary for a truly comfortable home away from home experience. 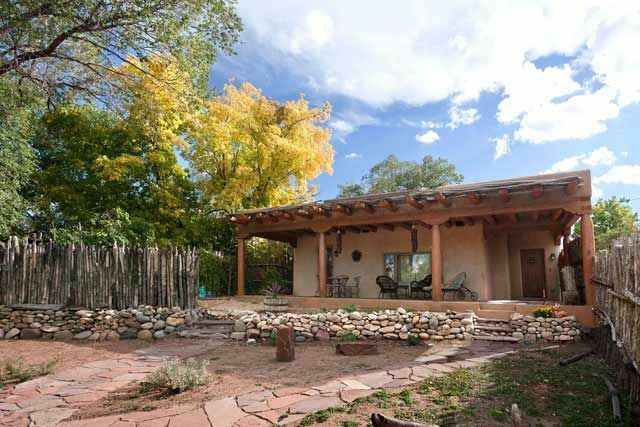 Casa Buena Vista is fully licensed by the City of Santa Fe and abides by all tax laws and city ordinances. Michael Roybal is the owner of Casa Buena Vista. He is also a ballroom dancer and has received gold medals in his competitions in many ProAm events. Beautiful and very comfortable home. Casa Buena Vista was a wonderful retreat. We stayed for a week, enjoying all that Santa Fe has to offer but very much looked forward to returning home each night. Snowed and rained while we were there, but would love to come back in the summer as the home is within walking distance to plaza and many outstanding restaurants. Highly recommend and we will be back!! Every year, I go on a trip with a group of friends. There are five of us so getting a place with plenty of room is always a challenge. This house was perfect. Two rooms and a trundle bed in the front room. The house has a ton of upgrades too. Brenda was very responsive to questions as well. Would definitely stay here again. My family loved the place! We will be back again! Thank you! It was our second stay here and did not disappoint! Great location close to the plaza. Very nice, cozy place to relax and unwind after a fun day on the slopes or around town! We’ll definitely be back! Embodies the spirit and soul of all that is Santa Fe! Romantic luxurious and a special place to bond with love ones. Perfect Location walking distance to downtown Santa Fe shopping restaurants ... Full garage leads through the Courtyard with a large hot tub for stargazing and enjoying crisp nights. Thanks for a wonderful stay! Compared to other VRBO we have rented this was just adequate. We were told we could get a earlier check in which was a requirement, but by 3:30 staff was still in the home working. Location was not a convenient walk to town. Hot water was lukewarm. TV was difficult to manage and Netflix had some kind of controls that limited use. The house was clean and comfortable but a bit dark. Dining table was beautiful but the plastic cover was not nice. We only stayed a few nights so everything except the shower was ok.
Casa Buena Vista II is walking distance to many local points of interest like the historic Santa Fe Plaza, Loretto Chapel, the Georgia O'Keeffe Museum and the Santa Fe Southern Railway. Additional attractions also within walking distance include Guadalupe Street, the Santa Fe Convention Center, Canyon Road, Cathedral Basilica of St. Francis of Assisi and the State Capitol. Santa Fe is rich in architecture, history and beauty and is often enjoyed through popular walking tours. Visitors may opt to spend the day browsing through Old Santa Fe's charming shops, galleries and Indian Market in the Plaza, where unique handmade Indian jewelry and crafts can be found.